Normally I don’t get anything out of Death Metal bands, even if it is called melodic or symphonic. But there are exceptions. One of them is called Dimlight and comes from Greece. 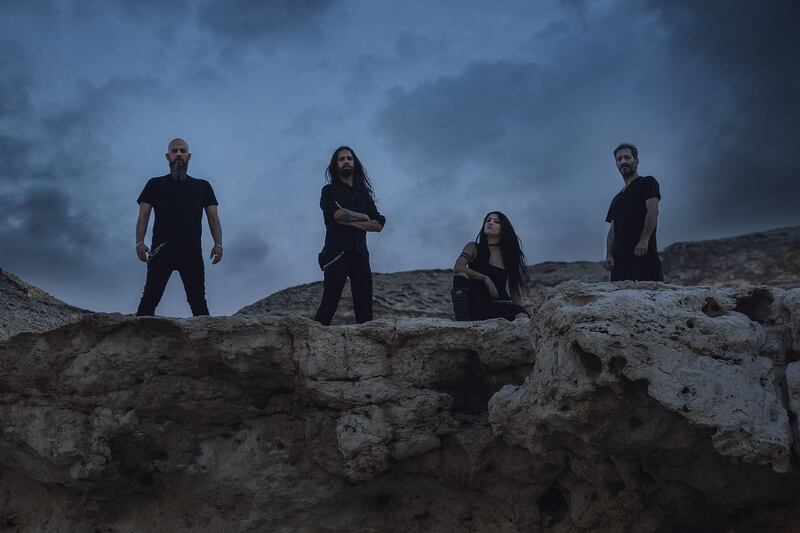 Dimlight mix Death Metal parts with moody Doom Metal. In contrast to the very angry growls of Peter Miliadi aka Invoker have always been enchanting female voices. Since the current singer Mora Hecate makes no exception. 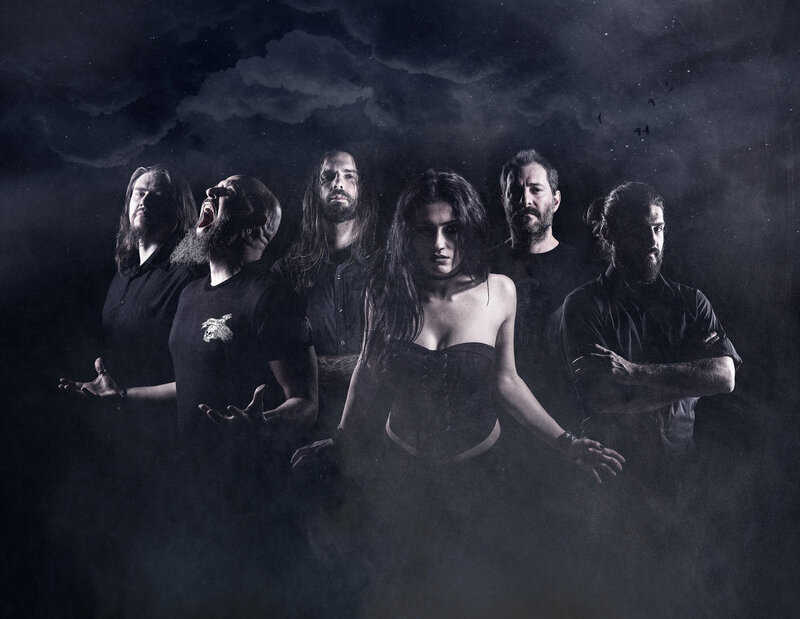 In October the band released the concept album “Kingdom Of Horrors“. Now the musicians answer me in an interview. MHF-Mag: Hello, I am Rainer. I write for Metalheads Forever Magazine. Thank you that I can do this interview with you. Introduce yourself briefly at the beginning. MHF-Mag: Please describe briefly your music style. Are your compositions influenced by other bands? Do you have prefigurations? 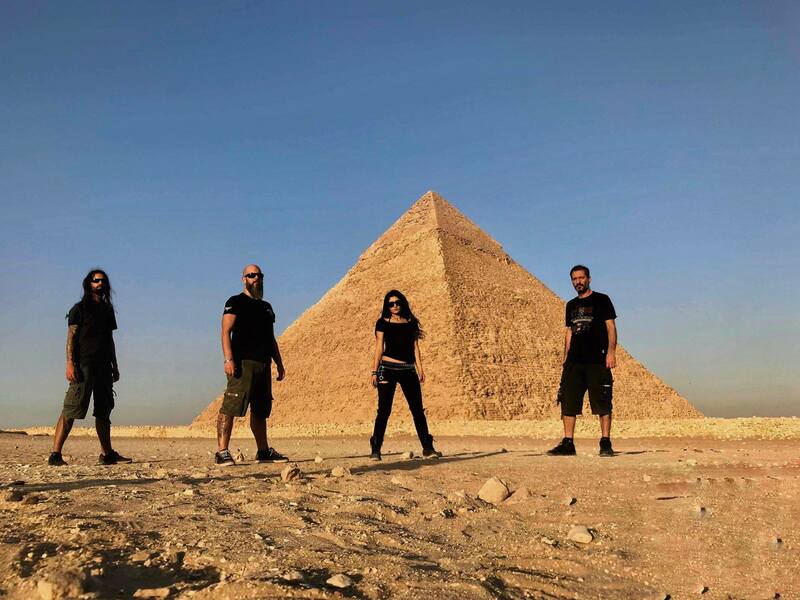 Dimlight: Dimlight is a Symphonic metal band with black and death metal outbursts, but that’s only a very generic label; because, nowadays, a band’s gotta have one. In truth, there is nothing predefined about our style nor do we follow religiously any strict musical rules or norms. Any element we like eventually finds its way into our musical compositions. Each listener, according to their taste and inclination, may hear many different influences in our music. From many well-known rock bands to classical composers and extreme-sound artists. MHF-Mag: If I’ve counted correctly, Mora is now the third female singer at Dimlight. What requirements does a singer have to fulfill in order to be integrated into the band? Was it difficult for you to find a new singer? Dimlight: Choosing a singer is always a difficult task. There are many considerations to be taken into account when making such a choice and, with Dimlight, this becomes even more intense since our “band structure” is different than those of most typical female-fronted bands out there. Our auditions for taking one a new singer were highly demanding and we listened to many very talented singers. However, this time we wanted to move a step further. We were looking for something unique. We needed someone who could master both the new and the old material, to have the powerful elements of both previous vocalists, but also to be able to combine them with her own unique qualities, competences and style. MHF-Mag: Mora, you follow in the footsteps of great singers (Sanna Salou and Eva Fourlanou). Were you excited when the singer’s position was offered to you? Dimlight: It is a great honor for a musician to follow in the footsteps of another that he highly esteems and regards as greatly talented. It is with sincere joy and gratitude that I share the band’s ongoing history with these previous most talented vocalists. I hope to prove myself not only as worthy as they in this position but also to thrive and grow as an artist following their example. MHF-Mag: You wrote a concept album with “Kingdom of Horrors”. Please tell which story the basis for this album is. Dimlight: “The Kingdom of Horrors” is a story of vengeance, through the eyes of an anti-hero. It presents his way to salvation through a tragic event that eventually wipes out his very existence. One way or another, we all have been in a similar situation, so anyone could relate to this concept to some degree or other. Of course, the basis of the concept remains in its core the telling of an entertaining and thrilling story aimed at captivating the listener’s imagination. MHF-Mag: I’ve heard a lot of concept albums in the past, where the song writing has suffered a lot from the rigid concept. On “Kingdom Of Horrors” this is not the case. How did you manage, that you tell a story, the individual songs but still work for itself? Dimlight: The narrative of our concept “works together” with the music – and the music, in turn, serves to give the narrative a new, more vivid and immersive dimension. For us, this way of going about composing our material is maybe the best way of expressing our ideas and really bringing them to life. If we had the story completed from the very start and there was no way of embodying it in a musical composition, then we would surely make a movie out of it! This ambition, however, is a bit on the costly side. Still, a band can dream, right? MHF-Mag: Mora, the female vocal lines were written by your predecessor Eva. Was it difficult to sing them during the recording? Dimlight: It wasn’t so much difficult as it was challenging. There’s a subtle difference. It is always a challenge for a singer to perform another musician’s work the correct way, especially when it is very demanding and has the highest quality standards. Still, that was what fascinated us when we attempted it in the first place. In my case, it wasn’t just about doing a “cover”. I transmuted these songs into something of mine, bringing in my own personal elements and character as a singer. Nevertheless, that had a positive effect in all my endeavors. The re-evaluation of a good idea, when maturely considered, develops the idea further and makes it even better: more polished, more refined. The same thing is true with musical compositions. MHF-Mag: “Kingdom Of Horrors” is not a single album but part of a trilogy. “Realm Of Tragedy” has already been released and you are still working on “Symphony Of Horrors”. “Realm Of Tragedy” is an instrumental album. Why did you give up singing here? Dimlight: Exactly. It is a multifarious release, a construct of many layers, if you will, but always revolving around the same core. Every layer has its own unique and distinctive esthetic and complements the others, thus forming an unbroken chain made of inhomogeneous links. In fact, that’s the very essence of music itself, it’s very nuts and bolts. Releasing an instrumental album had been one of our ambitions for a long time now and now, finally, we got the chance to do it organically. Perhaps in the future we’ll try again something similar. MHF-Mag: When I saw you live (at the Metal Over Malta Festival 2017), you were four on stage. Meanwhile, Apostolis (keyboards, orchestration) and Marios Koutsoukos (lyricist) have joined. What led to the extension of the band? Dimlight: Marios has been a member of the band for a long time, acting as our lyricist and his role is of vital importance in the formation, development and expression of our concepts – the “literary” part of Dimlight. Apostolis came in as a replacement to his predecessor, since that position needed someone talented to fill it. However, our live line-up performing on stage, still consists of four performers. MHF-Mag: Is that your live cast as well? I guess, Marios as lyricist is probably not on stage. Dimlight: Exactly – as we’ve said, our live line-up still consists of four performers but in the future this might very well change. MHF-Mag: Speaking live. Where can we experience you live on stage in the future? Dimlight: In a few days we will be performing in the city of Volos, Greece, and at the end of March we will participate as co-headliners in the “Ladies of Metal” Festival, in Athens, Greece. MHF-Mag: Thank you again for this interview. Do you want to say something to the fans at the end? Dimlight: Thank you very much for this interview. We would like to extend our warmest thanks and acknowledgements to all the wonderful and passionate people who have supported us throughout the years and still continue to do so with unwavering enthusiasm. We sincerely hope that you enjoy our new album and we can’t wait to see you in our mosh-pit in one of our live performances! Cheers!